I have been studying Mediterranean cetaceans since 1986, trying to promote their protection and reduce human impact on marine ecosystems. While moving beyond marine conservation on paper is a considerable challenge, I strive to make a difference and spend much time in the field. Bearzi G., Piwetz S., Reeves R.R. 2019. Odontocete adaptations to human impact, and vice-versa. In Ethology and Behavioral Ecology of Odontocetes. Springer, Heidelberg (in press). Bearzi G., Kerem D., Furey N.B., Pitman R.L., Rendell L., Reeves R.R. 2018. Whale and dolphin behavioural responses to dead conspecifics. Zoology 128:1-15. Bearzi G., Gimenez O. 2018. Searching for meaning in marine mammal shared data. Ethics in Science and Environmental Politics 18:9-13. Bearzi G. 2017. Action Plan for Marine Mammals in Israel, 2017–2022. Israel Marine Mammal Research & Assistance Center (IMMRAC), Israel. 101 pp. Bearzi G., Bonizzoni S., Santostasi N.L., Furey N.B., Eddy L., Valavanis V.D., Gimenez O. 2016. Dolphins in a scaled-down Mediterranean: the Gulf of Corinth's odontocetes. Advances in Marine Biology 75:297-331. In 2001 I was awarded a Pew Marine Conservation Fellowship, the world's most prestigious award in marine conservation, which included funding ($150,000) for a 3-year project titled "What threatens coastal dolphin populations in the Mediterranean Sea? Insight from interdisciplinary research in key areas". Pew Marine Conservation Fellowships have been granted since 1996 to fund innovative work in marine ecosystems, fisheries management, coastal conservation, and marine contamination. The 1996 edition of one of the most prestigious environmental prizes in Europe attracted 1000+ entries from 26 countries. After being selected as the best Italian project, the Adriatic Dolphin Project was seen by the jury as "a model of ongoing education, coupled with professional research and management", and was awarded as the Best European Project Overall. The international panel of judges included representatives of the Council of Europe, the Conservation Foundation, the United Nations Environment Programme and UNESCO. As the Adriatic Dolphin Project founder and director (1987-1996), I received the Grand Prix in Budapest. The prize funding (ITL 100,000,000) was used to support conservation-oriented research on Mediterranean coastal dolphins. In 2011 I received a Senior Research Fellowship from Texas A&M University and I was invited to spend nine months at TAMU's headquarters in Galveston, TX. In 2006 the 3-year project "Comparative Studies on Dolphin and Sea Turtle Conservation in the Amvrakikos Gulf, Greece, and the Catalano-Balearic Basin, Spain", which I presented in partnership with Dr. Alex Aguilar, was selected and funded ($30,000). The importance of the conservation activities carried out in the Adriatic Sea was recognized by the Ministers of the Council of Europe. In 1995 the Adriatic Dolphin Project was invited to participate in the European Nature Conservation Year. Furthermore, the project was nominated one of the "Ten Greenest Projects" by the Italian commission "Carnia Alpe Verde". 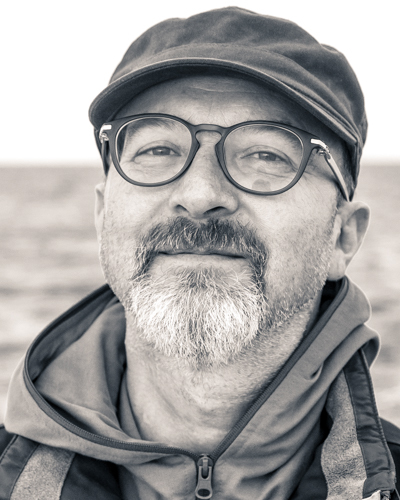 I was featured in Italian nature magazines and newspapers with popular titles such as "The Nobel Prize of the Sea awarded to a Venetian" (Il Gazzettino) and "Biologist of the Year" (Airone). Our review paper on whale and dolphin responses to dead conspecifics, published in the journal Zoology, has been the journal's most downloaded article (despite not being open access). The article was featured in the news section of Science: Morell V. 2018. Do dolphins feel grief? Science, June 2018. doi:10.1126/science.aau5170. I evaluated abstracts submitted to conferences of the Society for Marine Mammalogy and European Cetacean Society (ECS), contributions to ECS proceedings ("European Research on Cetaceans"), and project proposals submitted to the International Foundation for Science (IFS), the Italian National Research Centre (CNR) and the Earthwatch Institute. Former editor or co-editor of several newsletters on cetaceans. Member of the Editorial Board of FINS, the newsletter of ACCOBAMS (2004—2009). In the 1980s I designed some of the earliest educational multimedia computer programmes on cetaceans in Italy (with the Museum of Natural History of Pordenone and Fondazione Cetacea, Italy). I filmed and edited marine biology video documentaries. Cetacean distribution and sighting frequencies in the central and eastern Mediterranean Sea (from the oceanographic vessel "Bannock" and various sailing boats). Marco Bregoli. In progress. Social organisation of common bottlenose dolphins in the Gulf of Corinth, Greece. MSc in Marine Biology, University of Padua, Italy. Silvia Bonizzoni. 2016. 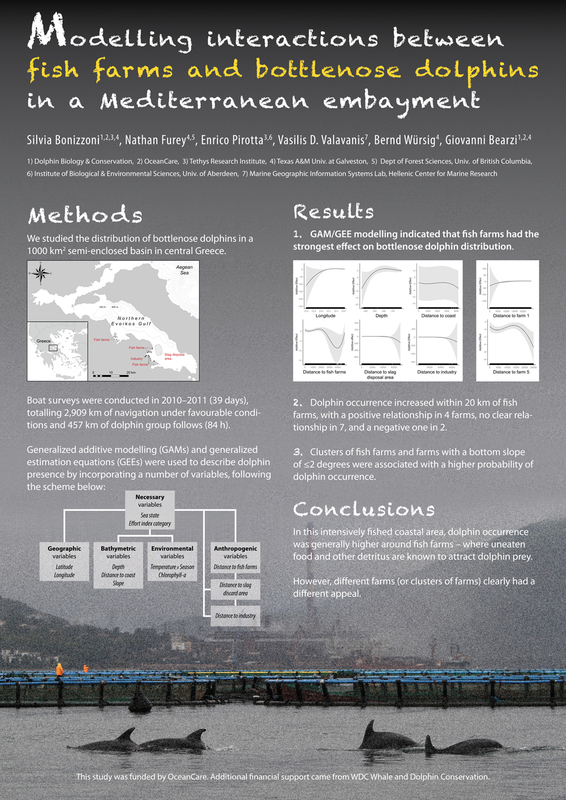 Modeling dolphin habitat preferences in a semi-enclosed basin in Greece. MSc in Marine Biology, Texas A&M University at Galveston, USA. Nina Luisa Santostasi. 2014. Population abundance of striped dolphin Stenella coeruleoalba and common dolphin Delphinus delphis in the Gulf of Corinth, Greece. MSc in Biological Sciences, University 'La Sapienza', Rome, Italy. Manon Roucaulte. 2012. Photo-identification of striped dolphin Stenella coeruleoalba in the Gulf of Corinth, Greece. Final report, National Veterinary School of Toulouse, France. Aina Pascual Cuadras. 2009. Distribution and habitat preferences of common bottlenose dolphins Tursiops truncatus in the Amvrakikos Gulf, Greece. MSc in Biodiversity, University of Barcelona, Spain. Christina Geijer. 2009. Evaluation of group definitions in a population of bottlenose dolphins Tursiops truncatus, western Greece. MSc in Nature Conservation, University College London, U.K.
Zsuzsanna Pereszlényi. 2009. Feeding behaviour of common bottlenose dolphins Tursiops truncatus in the Amvrakikos Gulf, Greece. MSc in Biology, University of Pécs, Hungary. Silvia Bonizzoni. 2008. Social organisation of common bottlenose dolphins Tursiops truncatus near the island of Kalamos, Greece. Degree in Environmental Sciences, University of Venice, Italy. Chiara Piroddi. 2008. An ecosystem-based approach to study two dolphin populations around the island of Kalamos, Ionian Sea, Greece. MSc in Zoology, University of British Columbia, Canada. Annalise Petroselli. 2006. Habitat use and distribution of short-beaked common dolphins Delphinus delphis around the island of Kalamos, Greece (eastern Ionian Sea). MSc in Marine Mammal Science, University of Wales, Bangor, U.K.
Nicola Bonel. 2005. Management of whale watching in two Mediterranean areas: the Cetacean Sanctuary (Ligurian Sea) and the Kvarneric (northern Adriatic Sea). Degree in Environmental Sciences, University of Venice, Italy. Erica Busatto. 2004. The method of photo-identification as a tool for the study of coastal Mediterranean dolphins. Degree in Marine Biology, University of Padua, Italy. Chiara Piroddi. 2004. An ecosystem approach to the study of common bottlenose dolphins Tursiops truncatus in the Amvrakikos Gulf, Greece. Degree in Environmental Sciences, University of Venice, Italy. Luigi Bundone. 2003. Status and conservation of the Mediterranean monk seal Monachus monachus. Degree in Environmental Sciences. University of Venice, Italy. Daria Tonini. 2003. Cetaceans of the Gulf of Venice: Conservation status and monitoring methods. Degree in Environmental Sciences, University of Venice, Italy. Daniela Pavan. 2002. The role of whale watching in marine conservation. Degree in Environmental Sciences, University of Venice, Italy. Francesco Quondam. 2002. Habitat use by short-beaked common dolphins Delphinus delphis in the eastern Ionian Sea. Degree in Natural Sciences, University of Trieste, Italy. Sebastiano Bruno. 2001. Social organisation of short-beaked common dolphins Delphinus delphis in the eastern Ionian Sea. Degree in Biological Sciences, University of Padua, Italy. Enrico Cabras. 2000. The feeding behaviour of two dolphin species in the eastern Ionian Sea used as an environmental indicator. Degree in Environmental Sciences, University of Venice, Italy. Nina Therkildsen. 2000. Immediate behavioural reactions of common dolphins Delphinus delphis and bottlenose dolphins Tursiops truncatus to remote biopsy sampling in the eastern Ionian Sea. Extended Essay - Biology, International Baccalaureate School, Norway. Sabrina Ferretti. 1999. Respiration pattern of common dolphins and bottlenose dolphins in Ionian Greece coastal waters. Degree in Biological Sciences, University of Milan, Italy. Caterina Maria Fortuna. 1996. Analysis of respiration patterns of bottlenose dolphins Tursiops truncatus observed in the northern Adriatic Sea. Degree in Biological Sciences, University of Florence, Italy. Sylvan Oehen. 1996. The acoustic behaviour of bottlenose dolphins Tursiops truncatus in the northern Adriatic Sea. Degree in Biological Sciences, University of Zürich, Switzerland. Mojca Kristan. 1995. Cetacean studies in the northern Adriatic: A case of the Tethys Research Institute. Extended Essay - Biology, International Baccalaureate School, Maribor, Slovenia. Melita Peharda. 1993. Surfacing patterns of bottlenose dolphins Tursiops truncatus (Montagu, 1821) in the northern Adriatic Sea. Extended Essay - Biology, International Baccalaureate School, Zagreb, Croatia. 2008 - Invited participant, international workshop on 'The Economics of the Global Loss of Biological Diversity' organised by the European Commission and the Federal Ministry for the Environment, Nature Conservation and Nuclear Safety of Germany, Brussels (Belgium). 1992 - Invited lecturer, 'The dolphins of Cres and Losinj', Faculty of Biology, University of Zagreb (Croatia). Bearzi G., Reeves R.R. 2004. 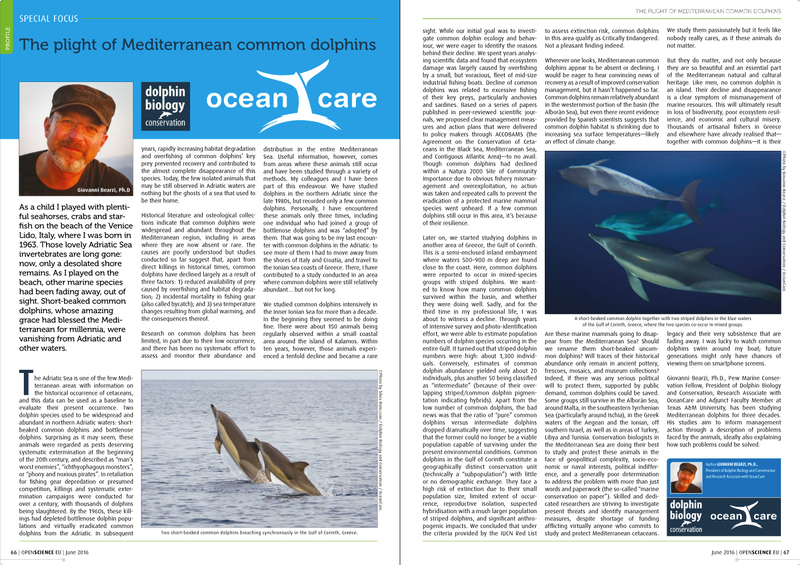 Where did the Mediterranean’s common dolphin go? Ecologia Mediterranea 30(2):243-244. Santostasi N.L., Ciucci P., Bearzi G., Bonizzoni S., Gimenez, O. In review. Assessing the dynamics of hybridization through a matrix modelling approach. Ecological Modelling. Bearzi G., Reggente M.A.L. 2018. Epimeletic behavior. Pp. 337-338 in Encyclopedia of Marine Mammals, 3rd edition (B. Würsig, J.G.M. Thewissen and K.M. Kovacs, eds.). Academic Press/Elsevier, San Diego. Bearzi G., Piwetz S., Reeves R.R. 2019. Odontocete adaptations to human impact, and vice-versa. In B. Würsig, ed. Ethology and Behavioral Ecology of Odontocetes. Chapter 11. Springer, Heidelberg (in press). Cañadas A., B-Nagy A., Bearzi G., Cotte C., Fortuna C., Gannier A., Laran S., Lauriano G., Lewis T., Moulins A., Mussi B., Pastor X., Politi E., Pulcini M., Raga J.A., Rendell L. 2012. ACCOBAMS collaborative effort to map high-use areas by beaked whales in the Mediterranean. Report to the Agreement on the Conservation of Cetaceans of the Black Sea, Mediterranean Sea and Contiguous Atlantic Area (ACCOBAMS). 24 pp. Cañadas A., Aissi M., Arcangelli A., Azzolin M., B-Nagy A., Bearzi G., Campano I., Chicote C., Cotte C., Crosti R., Di Natale A., Fortuna C., Frantzis A., Gannier A., Garcia P., Gazo M., Gutierrez-Xarxa R., Holcer D., Laran S., Lauriano G., Lewis T., Moulins A., Mussi B., Panigada S., Pastor X., Politi E., Pulcini M., Raga J.A., Rendell L., Tomás J., Tringali M. 2016. ACCOBAMS collaborative effort to map high-use areas by beaked whales in the Mediterranean. Report to the Agreement on the Conservation of Cetaceans in the Black Sea Mediterranean Sea and Contiguous Atlantic Area. 44 pp. Mo G., Notarbartolo di Sciara G., Bearzi G., Cozzi B. 2004. Conservation policies from a regional to a national approach: the formulation of the Italian Action Plan for the conservation of cetaceans. European Research on Cetaceans 15:177. Bearzi G. 2009. Delfini e pesca: interazioni trofiche e depredazione in aree marine costiere del Mediterraneo. In: Proceedings of the workshop "Pesca e gestione delle Aree Marine Protette" (P. Guidetti, ed. ), Porto Cesareo, 30 - 31 October 2008: 7-13. Piroddi C., Bearzi G., Christensen V. 2009. Effects of local fisheries and ocean productivity on the Northeastern Ionian Sea ecosystem. Pp. 39-40 in: Palomares M.L.D., Morissette L., Cisneros-Montemayor A., Varkey D., Coll M., Piroddi C. (eds. ), Ecopath 25 Years Conference Proceedings: Extended Abstracts. Fisheries Centre Research Reports 17(3). Fisheries Centre, University of British Columbia [ISSN 1198-6727]. 167 p.
Mazzoldi C., Bearzi G., Brito C., Carvalho I., Desiderà E., Endrizzi L., Freitas L., Giacomello E., Giovos I., Guidetti P., Ressurreição A., Tull M., MacDiarmid A. 2018. From sea monsters to charismatic megafauna: change in perception and use of large marine animals. Ocean Past VII Conference, Bremerhaven, Germany, 22-26 October 2018. Bearzi G. 1989. Contributo alle conoscenze sulla biologia di Tursiops truncatus (Montagu, 1821) nel mare Adriatico settentrionale. Tesi di Laurea in Scienze Biologiche, Università degli Studi di Padova, Italia. 172 pp. Bearzi G. 1991. Il tursiope del Museo Civico di Storia Naturale di Pordenone. Pp. 97-100 in Anonymous, ed. Il museo spettacolo. ANMS, Museo delle Scienze di Pordenone. Bearzi G. 2003. Studies on the ecology and conservation status of short-beaked common dolphins (Delphinus delphis) and common bottlenose dolphins (Tursiops truncatus) in the Mediterranean Sea. Ph.D. dissertation, University of Basle, Switzerland. 202 pp. Bearzi G. 2006. Our friends the dolphins. An illustrated educational book for children translated in 12 languages. 32 pp. Bearzi G. 2011. Common dolphins becoming rare. Public Service Review: European Union 21:659. Bearzi G. 2016. The plight of Mediterranean common dolphins. OpenScience EU, June 2016. Pp. 66-67. Bearzi G. 2003. Short-beaked common dolphin Delphinus delphis (Mediterranean subpopulation). The IUCN Red List of Threatened Species 2003: e.T41762A10557372. Bearzi G., Fortuna C., Reeves R.R. 2012. Tursiops truncatus (Mediterranean subpopulation). The IUCN Red List of Threatened Species 2012: e.T16369383A16369386. Notarbartolo di Sciara G., Frantzis A., Bearzi G., Reeves R.R. 2012. Physeter macrocephalus. The IUCN Red List of Threatened Species 2012: e.T41755A2955634. I enjoy playing my acoustic and electric guitars, composing songs, and editing/mixing my music. These are the three albums I produced so far.